By Sandra Schulman WPB Magazine Arts & Entertainment writer, Music and Film Producer. There is something magical and eternal about stained glass, an art that must have light to come alive. The Materio family has been keeping alive this centuries old art in new ways. The business began with the Materio family’s passion for the fine art of stained glass and just $200 in 1976. 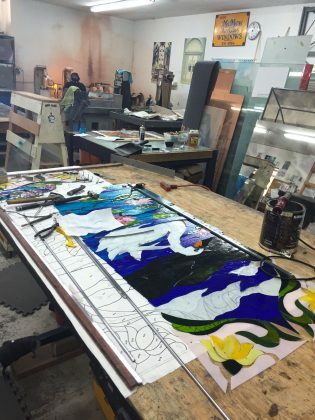 Now after four decades in Palm Beach County, McMow has become one of the largest glass studios in the country, with a 10,000 square foot building on North Dixie Highway that has the main offices, gift shop, studio and design workrooms and space for weekly classes. It’s all in-house. The in-house design team works with clients ranging from restaurants to residences to the Versace mansion to create original glass doors, windows, ceilings and other special custom designs. The art of stained glass goes back at least a thousand years. 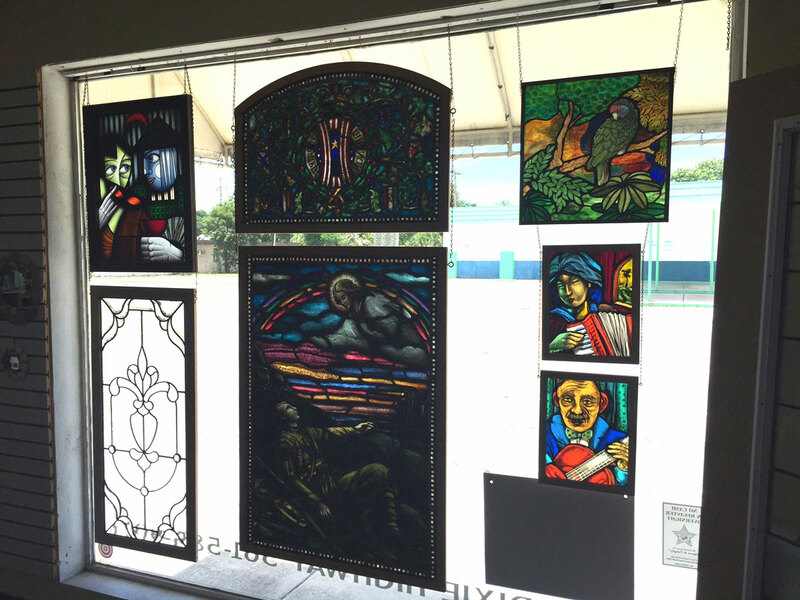 The term stained glass can refer to colored glass as a material or to works created from it. Throughout its thousand-year history, the term has been applied almost exclusively to the windows that light up churches, mosques and other significant buildings with the glass windows giving houses of worship the spiritual feel. 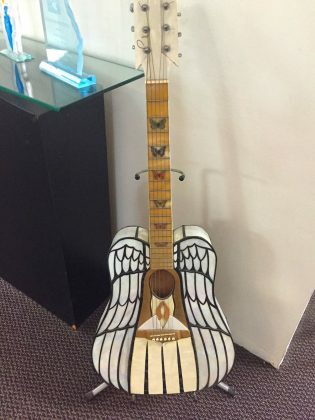 Although traditionally made in flat panels and used as windows, the creations of modern stained glass artists that McMow make also include three-dimensional structures and sculpture like a stained glass guitar they made for a client. Modern vernacular usage has often extended the term “stained glass” to include objects of art created from fancy glasswork exemplified in the famous lamps of Louis Tiffany with their dragonflies and cascading flowers. As I got a tour of the work studios from Creative Director Taylor Materio and her mother Shanon, they told me of how the business is a family affair as I met the father Phil and brother who all work there. Starting in 1976, Shanon learned the craft and within two years they had gotten their first big commission. 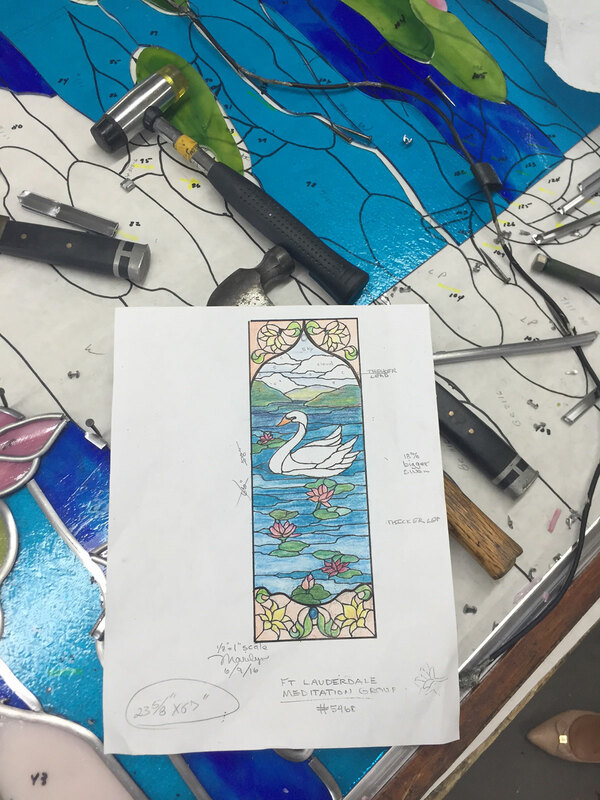 They showed me various jobs in progress such as a set of Art Deco style doors for a new home and a large window with a swan and lotus flowers for a temple. The pieces were laid on top of a penciled outline of the design marked with each pieces color and type. Popular Florida designs include flowers, birds, sunrises and ocean views. The glass itself is glass that has been colored by adding metallic salts during its manufacture. The colored glass is crafted into stained glass windows in which small pieces of glass are arranged to form patterns or pictures from a template, held together (traditionally) by strips of soft bendable lead that has channels cut into the sides where the glass fits into and supported by a rigid frame. The joints are then soldered together. Painted details are often used to enhance the design. Shanon is a self described hoarder as she buys up entire stocks of vintage glass pieces and ornaments that can potentially be used to make one of a kind artworks. 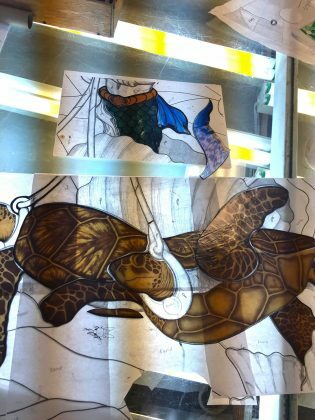 One piece they had in progress of King Neptune riding sea turtles had multiple pieces that were custom painted such as the turtles heads, an octopus on the sea floor and the Kings fishy tail. Such pieces are labor intensive as the paint must be fired in the kiln repeatedly to fuse it to the glass. The large King Neptune piece will take around 4 months to complete. The process is so solid and complete there has only been one new tool designed for the artisans in 25 years – a carbinde cutting tool. Everything else is done as it was centuries ago. It’s labor intensive and often messy work. Many of the 15 employees have been there for decades and learn specific crafts such as the cutting of the glass or grinding the edges to bevel them, steps that must be repeated over and over in the window creation. The company has done restoration work on churches 300 years old and salvaged many pieces in Florida from churches that are being torn down. Some of the salvaged art hangs in the studio. “We find that contemporary work is the most requested now,” Taylor says. “clients want modern, graphic designs. Churches as well are shifting away from classical narrative imagery and asking for more vibrant, flowing, slightly abstract designs. We offer both as the spirituality is a big part of the experience with stained glass and the light that glows through it.” She shows me a wall with examples of the more traditional story telling scenes and then ones that are brighter and more modern. 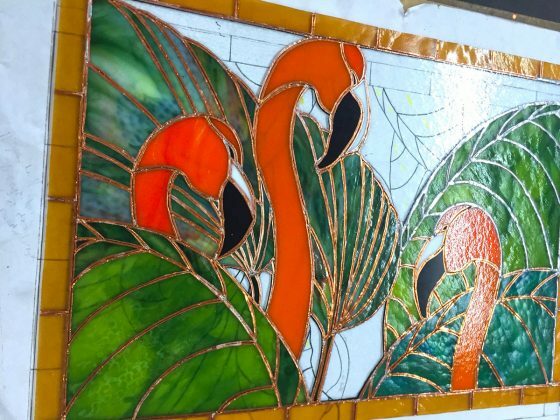 To keep up with what clients in South Florida want in terms of colors and unique design, McMow has partnered with an Oregon glass making company to create a unique line of sheet glass called FLORAdia, which showcases the classic beauty of Palm Beach style. This new line, inspired by the iconic designs of Lilly Pulitzer, was created in celebration of McMow’s 40th Anniversary. One sheet of the glass has a pink center and green blocks of color on either side, the other sheet has the colors in reverse. 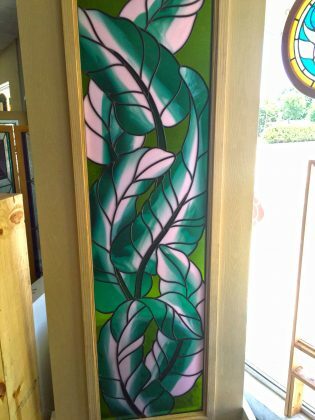 “These are especially beautiful when used to make palm frond designs,” Taylor says as she shows me the two pieces side by side hanging in the stores front windows. 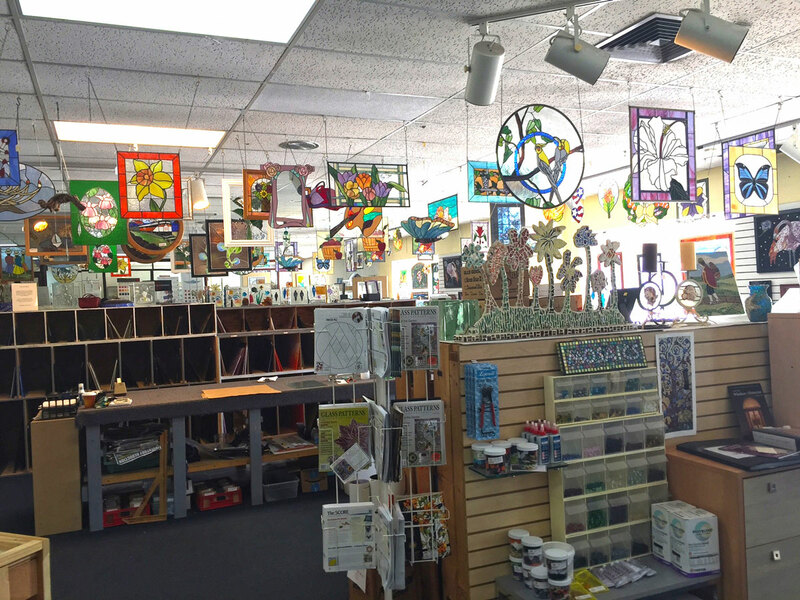 The store carries glass jewelry, books, paper weights, wind chimes and other fanciful glass creations. 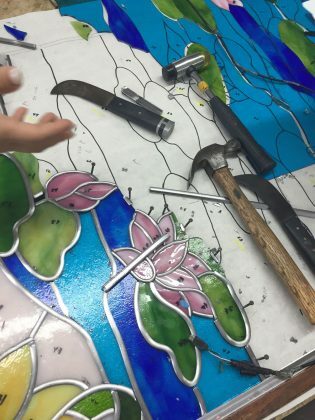 One can also buy the supplies to make stained glass –solder, copper foil, glass cutters, flux, patina, grinders and saws. On the far side of the building from the workshop is the studio where classes are held in various mediums like Landscapes with Frits and Powders, A Taste of Fusing, Wind Chimes, and how to make jewelry with glass. Classes are held at all levels of experience. It’s a unique place, open to the public where one can see all the steps and phases of how large scale, custom stained glass is created.